GSP vs Nick Diaz might be next? What about the Silva vs GSP Superfight? After last Saturday’s UFC 129 event, Firas Zahabi – George St-Pierre’s trainer – announced that the fighter’s left eye will be okay. He even believes that a champion vs champion match may be in GSP’s future, as UFC welterweight champion may face Strikeforce’s Nick Diaz next. However, there are talks already coming out that GSP might move up to middleweight and challenge Anderson Silva, should he beat Jake Shields. Firas Zahabi, on the other hand, said that it wouldn’t be that fast for George St-Pierre to move up — though he wouldn’t rule it out. UFC President, Dana White, said that the GSP vs Diaz bout is something that he can execute, despite the latter’s contract with Strikeforce. He even stated his plan of talking to the Strikeforce champ for the bout’s possibilities. Would you like to see GSP taking on Nick Diaz? Share your thoughts by leaving a comment. i can see how this fight makes sense on paper, but there is a reason that nick ran to sf with his tail between his legs. 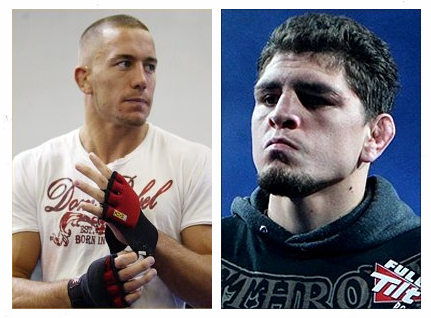 gsp v diaz would be a very different fight than shields v gsp. primarily because nick has striking skills and crap wrestling so gsp would use his wrestling and top control to cruise to a ud or tko. Nick will regret taking this fight because he will likely lose his sf title and then get thrown to the wrestling brutes that are indigenous to the ufc.